For Week 11 of the 2018 Oregon high school football season, here's a look back at the Plays of the Day. To see complete game stories from all these contests, go to the Prep Football Tab. 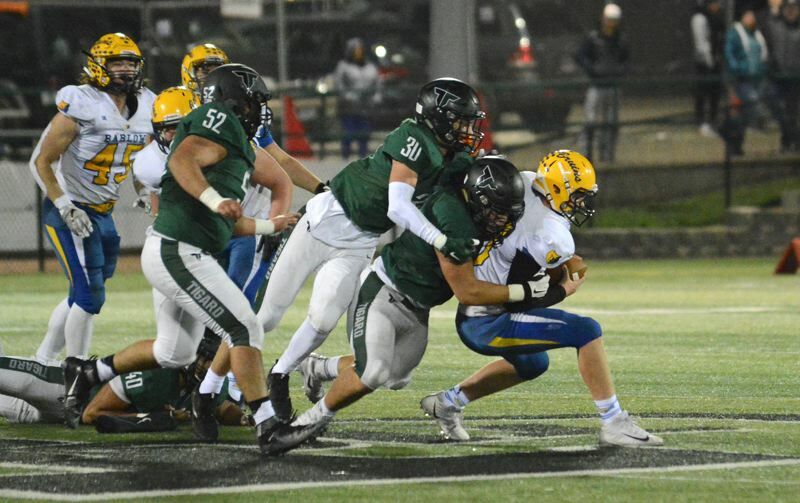 TIGARD 45, BARLOW 20: The Tigers' front line broke through for eight sacks totaling more than 60 yards in losses, as the Bruins put up only six points in the second half. 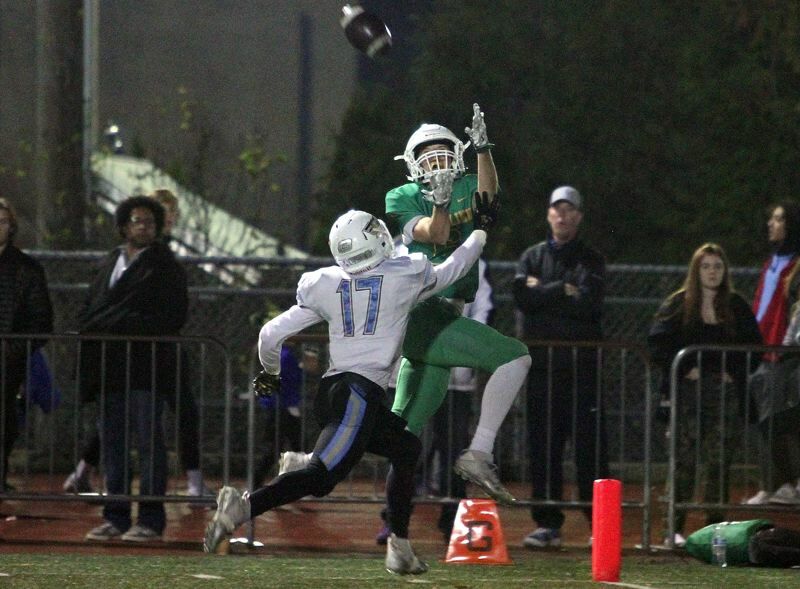 Barlow's last chance to climb back into the game was vanquished when Tigard's Isaia Porter broke through for a sack that put the Bruins in a third-and-24 situation. Two plays later, teammate Mahmud Mustafa crashed the pocket for another sack to give the Tigers a turnover on downs with 8:28 to play. KENNEDY 27, SHERIDAN 6: Leading 27-6 early in the fourth quarter of the Class 2A state quarterfinals, the Kennedy football team was looking to prevent a late rally by the No. 2 Sheridan Spartans. On fourth-and-goal from the 5-yard line, Spartan quarterback Jacob Debuff threw a pressured pass up for grabs toward the back of the end zone to teammate Chris Savoldi. Kennedy defensive back Dylan Kleinschmit met Savoldi in midair to retrieve the ball and the two came down fighting for possession. The referees ruled in favor of Kleinschmit, giving the Trojans a touchdown-saving interception that sucked the wind out of Sheridan's comeback attempt and put Kennedy on a path back to the semifinals after a one-year absence. CENTRAL CATHOLIC 28, TUALATIN 21 (OT): Central Catholic was trailing Tualatin 21-14 after forcing the Timberwolves to punt with 3 minutes and 22 seconds left to play in Friday's Class 6A state playoff second-round game at Hillsboro Stadium. On the next play following the punt, Central Catholic junior running back Elijah Elliott broke through a hole in the middle and sprinted 77 yards for a touchdown, tying the game at 21-21. 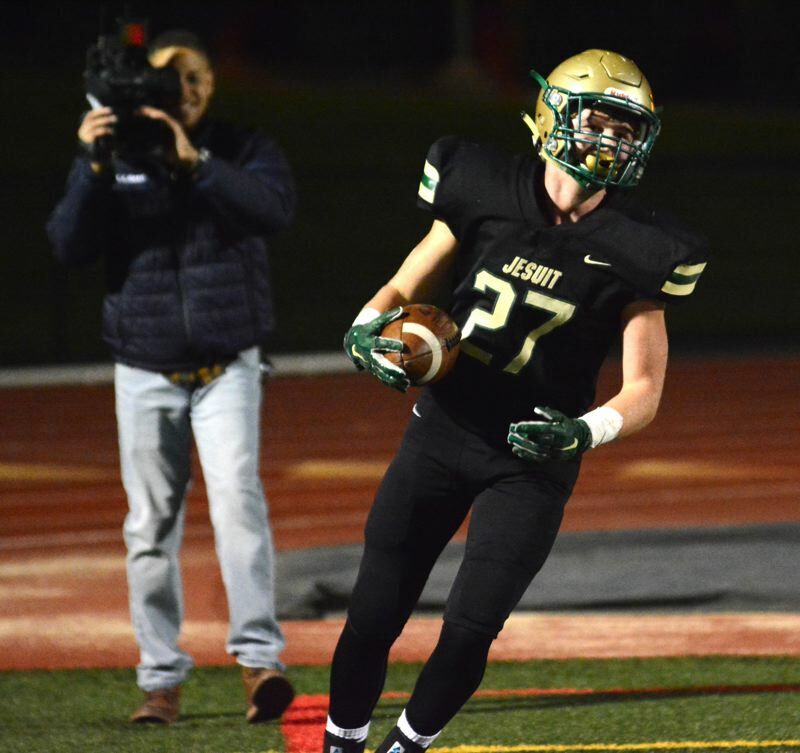 JESUIT 45, REYNOLDS 7: The Crusaders put up two touchdowns in 20 seconds, capped by Will Spitznagel's 9-yard scoring strike to younger brother Luke Spitznagel to put the Crusaders in charge, leading Reynolds 21-0 at the end of the first quarter. LIBERTY 51, SUNSET 44: Liberty junior Cole Smith scored his game-winning 3-yard touchdown run off the option give from Brad Norman. And on the two-point try, Norman rolled right, couldn't find his first option, reversed course to his left to buy time, found Marquis Brown in the back of the end zone for the toe-tapping two-point try to give his team a 51-44 lead. BANKS 28, MARIST CATHOLIC 14: With Banks hanging on to a 21-14 fourth quarter lead, the Braves' Blake Markham turned a short pass into an 80-yard catch-and-run touchdown up the left sideline to ice Banks' state quarterfinal win against Marist, sending the Braves to a semifinal match up next week versus Marshfield. WEST LINN 55, LAKERIDGE 20: With Lakeridge leading West Linn 14-13 in the second quarter, Lions' senior linebacker Elijah Ntsasa recovered a Pacer fumble at the Lakeridge 23-yard line. From there, on West Linn's second play, senior quarterback Ethan Long hit senior wide receiver Jake Mastrandrea for a 25-yard score at the left flag and — following Abdul Ali's extra point — gave the Lions a 20-14 lead they would not relinquish. LAKE OSWEGO 49, OREGON CITY 14: Playing a Three Rivers League opponent, the Lake Oswego football team didn't want to leave anything to chance on Friday night. They proved right from the get-go, with senior quarterback Jackson Laurent connecting with junior wide receiver Thomas Dukart for a 32-yard touchdown pass that set the tone as the Lakers piled up a 49-0 halftime lead.